WAL DONALD held the job last year-a remarkable choice, for Wal.s only 5ft. l0in., and his usual place has been in a back pocket, where he had been a great success. The brainwave was most successful, however as no full forward was comfortable against him. 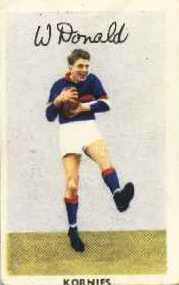 So highly was his play regarded that he won the club's best and fairest trophy. His success came as much from grit and determination as fine anticipation and pace and dash. It was really a fine effort. This versatility is shown by the fact that he has been placed in the centre this year. In the practice games he showed he could handle that job just as well. 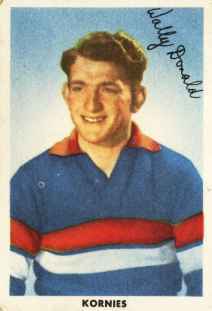 WAL DONALD is cue of the most useful players in the Footscray side. 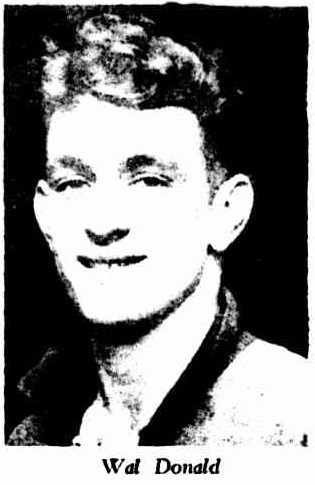 He came from Bray- brook in 1945, and played with the seconds that year. In the first game of the next season he was chosen as 19th man, and has been a regular ever since. Soundness is his chief characteristic, and officials claim that there has never been a better half-back in the club. 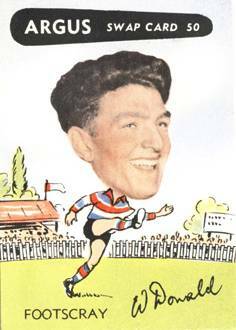 His prowess earned him best and fairest club award last year. He has superb judgment, is a grand mark, and a splendid kick with either foot. In addition, he turns either way. Wal is a coppersmith- a heavy job that gives him great strength in the hips and shoulders. He is single, living with his people in Footscray, and is a good cricketer. 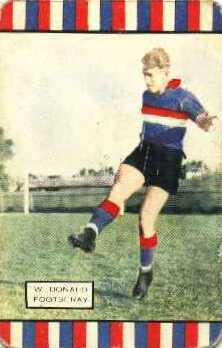 His team, St. Monica's, won the junior premiership last season.